Steelers @ Chiefs Week 7 Preview and Prediction | "IT'S A STEELERS WORLD"! If you look at it on paper..as well as on the scoreboard, the Pittsburgh Steelers have dominated the Kansas City Chiefs over the past 45 years. 712 points for the Steelers, averaging 24.5 PPG to 553 points for the Chiefs, averaging 19 PPG..by my numbers anyway. Which are correct I might add, but here is a look at the entire history in a nutshell. The one important thing to take away from the series history between the two teams is that the Chiefs actually lead the Postseason Series 1-0. Granted it was accomplished 21 years ago, but it was the most important win for them to take home..something for them to fight for. So how do you think they are going to enter this game..being the 30th time the teams will meet? The 9th time they have met in the month of October in the regular season series, with the Steelers owning a seven-game advantage of 8-1 in the month of October vs. the Chiefs. 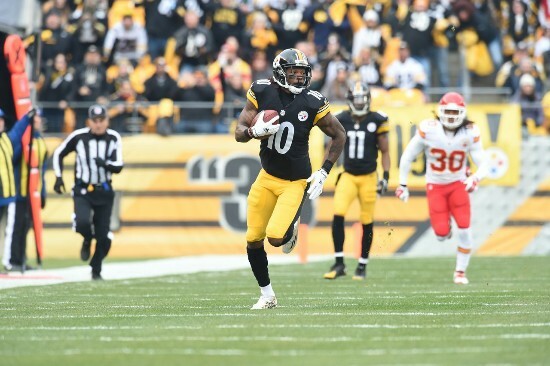 PITTSBURGH – Pittsburgh improved to 10-5 on the season and clinched the team’s ninth postseason berth since 2000 with a 20-12 victory over Kansas City at Heinz Field. Kicker, Shaun Shuisham hit a 23 yard field goal to give Pittsburgh a 3-0 lead. K Cairo Santos connected from 35 yards to tie the game 3-3 at the end of the first quarter. Santos made one from 25 yards early in the second quarter to give the Chiefs the team’s only lead of the game. On the Steelers’ ensuing drive, running back, Le’Veon Bell scored on a one yard run to give Pittsburgh the 10-6 lead. A lead that they kept..and continued to add on to. The Chiefs..in Steelers territory midway through the third quarter. Chief running back, Jamaal Charles caught a pass and rookie DE Stephon Tuitt forced a fumble on Charles that was recovered by LB Vince Williams. The Steelers then took over and marched 75 yards on 10 plays. quarterback, Ben Roethlisberger capped off the drive with a three yard touchdown pass to receiver, Antonio Brown to give the Steelers a 17-6 lead. Santos made a 43-yard field goal and Suisham responded with a 23-yard make of his own. Kansas City cut the lead to 20-12 on Santos’ 23-yard make but the team’s onside kick attempt was recovered by Steelers fullback, Will Johnson. The Steelers offense then took the field in their victory formation. Nothing has changed. The Steelers may not be the dominating force that they have been over recent years..but they are still the Steelers. A Steelers team that has gotten stronger over the past 6 weeks even with the injuries to Ben Roethlisberger, Maurkice Pouncey and others. Including the more recent Kelvin Beachum and Mike Mitchell..but the Steelers defense have played in the “Musical Chairs” type of setting, replacing players with other players like a jigsaw puzzle if you will. Not to mention with the newly vamped, Landry Jones whose “short” game against the Arizona Cardinals was borderline incredible by most standards Put that with a running and receiving game unmatched in the National Football League and the Steelers should make the series 21-9. The Chiefs on the other hand? Alex Smith has been confused lately, and with Jamaal Charles out of the lineup as well as receiver, Jeremy Maclin nursing a concussion he suffered during last week’s win over the Minnesota Vikings and may not play Sunday, Smith is more than likely to become even more confused. Head coach Andy Reid has said to be preparing for both Roethlisberger and Jones really doesn’t matter if his offense isn’t prepared for the Steelers D..which I believe they will not be. Keeping it a close one due to the fact that the Chiefs are still a professional football team, who have a tendency to play a lot better at home.